Is ‘Youth Ministry’ Wholly Biblical? The words of the post has lingered on my heart after seeing it receive significant reaction on social media forums like Facebook and Twitter. Is youth ministry entirely biblical or is it a result of a generational deviation from God’s purpose for the family? In the last decade, I’ve served young people in Lagos, London, Liverpool and most recently Essen. I’ve also been privileged to speak across multiple cities. But whether it’s in Africa or Europe, I have been met with the same concealed notion that the success or failure of young people is directly linked to their respective youth ministries. Even Samuel, who grew up in the church, had a father-son relationship with Eli. My reservations about the misplaced notion of youth ministry persists because I don’t see biblical evidence that affirms it, yet. 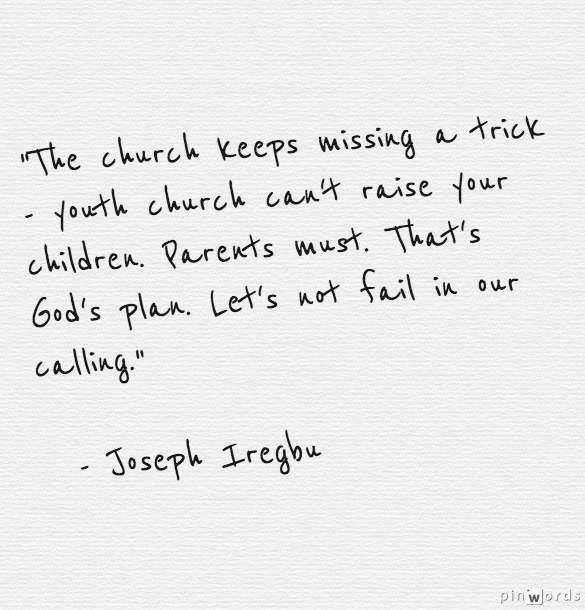 Scripture is replete with directive to parents on raising their children, not the youth church. I believe that the youth ministry (as we know it today) evolved partly as a result of a desire to give children an identity that God intended to emerge from the home, not the corporate church. Our society is in rapid decline and so is parenting in general. But if we must take hold of our future and raise wholesome children and youths, we need to return to the God-intended way; God-centered families where biblical teachings are central. While I believe in the sincerity of this awesome branch of the church, I believe its goal should be to support and affirm the messages of a God-focused family, not primarily lead the delivery of that message as the norm. Where do you see the true place of youth ministry in the Christian family and church? Leave a comment.